Manufactured using pressure treated red wood pine, the Finch is the smallest lean-to within the Swallow range. Featuring a width of 4'6 (1.38m), this greenhouse is available in varying lengths from 6'4 (1.95m) up to 12'7 (3.84m) and perfect for long yet narrow outdoor spaces. With a ridge height of 8'9 (266cm), tall plants can be left to grow up against the wall whilst the staging along the glass side can be used for potted plants. Unlike many other greenhouse manufacturers, each Swallow greenhouse includes roof vents with automatic openers and staging within the standard price. Both delivery and install (within mainland UK, extra charges apply to addresses 15 miles north of Glasgow) are also included and are completed by the Swallow team. New for 2011, the Finch can be painted for an additional charge, choose between Somerset green, Willow, Sea grass, Black Ash, Maple leaf and Seasoned Oak from the Cuprinol Shades range. Please contact us for further details and pricing. 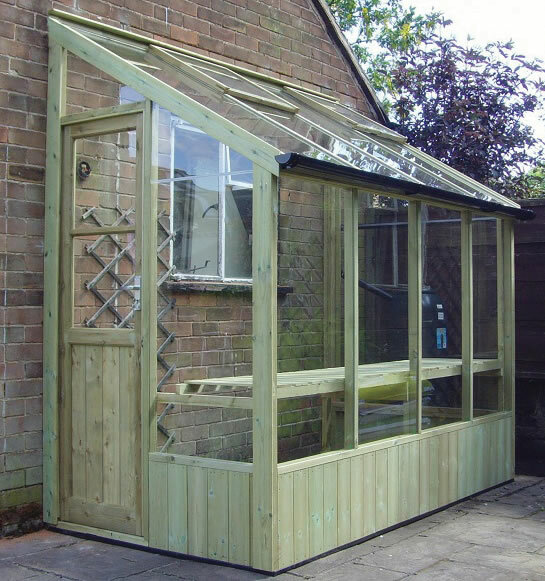 Finch Wooden Lean-to Greenhouse 10'5 x 4'6 (3.18m x 1.38m), pressure treated for longevity. Includes two roof vents, each with automatic opener and staging. Includes Free Installation! High quality Finch Wooden Lean-to Greenhouse 12'7 x 4'6 (3.84m x 1.38m). Ideal for any long, narrow outdoor space. Includes Free Installation! The Finch, a compact Wooden Lean-to Greenhouse 6'4 x 4'6 (1.92m x 1.38m). High quality greenhouse, pressure treated in green. Includes Free Installation! Pressure treated Finch Wooden Lean-to Greenhouse 8'4 x 4'6 (2.55m x 1.38m). Featuring two roof vents, automatic openers and staging. Includes Free Installation!